FLOE can be used to survey many types of fish in North America. "How many fish are there?" is an important question in managing any fishery. Traditional methods of answering this question include direct sampling, egg sampling, sonar survey, and aerial survey. Each has its limitations. Perhaps the most severe limitation of the surface-based techniques like sampling and sonar is that ships are slow. Only a small fraction of the possible habitat can be surveyed, and the cost is high. Aerial surveys can cover a much larger area of the ocean, but the data are less reliable. The data consist of estimates made by expert observers; the accuracy of these estimates varies from observer to observer and also from day to day as surface and illumination conditions change. 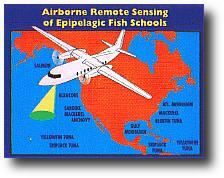 ETL is developing an airborne lidar for fisheries surveys (named FLOE for Fish Lidar, Oceanic, Experimental), in cooperation with the National Marine Fisheries Service (specifically, with the Southwest Fisheries Science Center ) and Alaska Fisheries Science Center. The system will use a pulsed lidar to profile fish density from a small aircraft. The basic technology was developed by the Department of Defense to detect other objects in the water. The data do not depend on the skill of the observer or on the conditions at the surface, and are thus of much more uniform quality. LIDAR is an acronym for LIght Detection And Ranging. In its simplest form, a short pulse of laser light is directed toward a target. A receiver is pointed in the same direction and waits for a return signal reflected from the target. The elapsed time indicates the targets range. The strength of the return provides additional information about the target. In this case, the target is schools of fish swimming in the ocean. By putting a compact Lidar system in a small airplane we can fly over large areas of the ocean and determine how many fish there are in that section of the ocean. The system will work best on the upper ocean fishes, such as anchovy, sardine, mackerel, and herring. The cost is less than 10% of a ship survey per survey kilometer, and the depth penetration is more than 3 times that of a visual survey. What does the lidar look like? Details and photos of the lidar are given on the instrument page. What aircraft has it flown on? We have flown on a variety of aircraft. The requirements are for a downward-looking port with a diameter of 30 cm, allowance for about 200 kg for the equipment, and at least 1000 W of available electrical power. Photos of the installation can be seen for a Partenavia Observer, a Beechcraft King Air 200, a King Air 90, a Casa, a Rockwell Aerocommander, a Cessna Cardinal, and a DeHaviland Twin Otter. For survey purposes, we would like to convert the lidar signal into a depth profile of the biomass density for each species. This means that we need to know the reflectivity of each target species and we need to be able to identify the species responsible for our signals.At this time, laser reflectivity measurements have been only made on one species of live fish, sardines (Churnside, et al.1997), although more measurements have been using frozen fish in the laboratory (Churnside, 1991). Species identification cannot be done unambiguously using only the lidar signals, and other clues must be considered. The lidar can tell the difference between large fish like tuna and salmon and small fish like sardines and herring. The habitat being surveyed generally eliminates most species from consideration. The most important factors are depth in the water column and latitude. In many cases, we rely on visual observations from the air and on ship reports. In these cases, we have to assume that the distribution of species is similar where we do not have this information. The laser beam is expanded to meet the 1993 ANSI standards for occupational laser safety at the surface. We also avoid illuminating boats by momentarily blocking the beam as we pass over. We have also investigated the potential hazard to marine mammals (Zorn, et al.) for 13 species of cetaceans and pinnipeds. We found that all of these were considerable less sensitive to laser illumination than humans and therefore not at risk from our lidar. There are no species that are expected to be more sensitive than the ones examined based on available information. Other marine creatures are expected to be even less sensitive than marine mammals from what we know about their visual systems. The lidar has, or will have, been used in a number of field trials. More details can be found by clicking on the location and year for Florida, 2000; Alaska, 2000; Spain and France, 1999; California, 1999; Spain, Portugal, and France, 1998; Washington State, 1997; California, 1997; and the California, 1995 ship tests. The target species have generally been sardines and anchovies, although the 1999 California flights were looking at squid, and the Washington flights were looking at herring. We are continuing to add results as we continue to work with the data.